A new blog named yenimedya.wordpress.com has begun webcasting in July, 2009. It was created by the researchers who study in the field of new media. The blog which is moderated by Burak Doğu, Günseli Bayraktutan-Sütçü, Işık Barış Fidaner and Mutlu Binark aims to bring together the studies mainly in the fields of the Internet, social sharing networks, digital games and share them in the frame of critical approaches. Therefore it invites you to contribute as authors. It expects you to write on the topics like blog management, new media bans, confidentiality, the phenomenon of surveillance, user and addiction, reproduction of social networks, user generated content, alternative media, new media industry, new media politics, creative industry and labour power, presentation/performance of self on new media, types of digital gamers, practices of new media use and contrasts between generations, relationship between new social movements and new media environment, the Internet and online journalism, etc. in this “new written culture” platform. Another aim of the moderators is to compile the academic knowledge on new media that is produced in Turkey and present it in the means of an archive. So that the knowledge produced in Turkey can be made visible and it can be evaluated. You may convey your book reviews, articles, projects, thesis abstracts, conference and activity announcements through the blog. Also you may submit your offers on the issues that you believe to be analysed and criticized. The group composed of Ali Toprak, Ayşenur Yıldırım, Eser Aygül, Mutlu Binark, Senem Börekçi, Tuğrul Çomu, who called themselves as “Collective Production” in order to emphasize and realize partnership and collabration in all phases of the study, decided to analyze the social networking sites (SNSs) and to understand what is happening both inside and outside the Facebook. They were in collabration from beginning to the end in order to study social organizations, privacy issue, practices of voyeurism, surveillance, and showing up, virtual relationships, identity practices, individual performances, and representation of this new communication medium in mainstream media. While analyzing the above stated subjects via the account they created on Facebook following the local elections on the 29th of March, 2009 in Turkey, Collective Production decided to use their account as a social campaign for ensuring and promoting gender equality. They launched a campaign of petition on Facebook which was called “Open shelter for women in every district of Ankara”. This campaign which started on the 1st of May, 2009 and lasted until the 14th of May, 2009 asked the municipalities to be responsive to this issue. The group administred an offline survey to their profile friends named “The Uses of Facebook”. The profiles and performances of the group’s Facebook friends were also analyzed as a text. In this phase of the study called “Facebook by Asking and Seeing”, a partial picture related to Facebook usage practices was drawn. The group which gained inspiration from Descartes’s philosophical statement of “cogito ergo sum” which is translated in English as “I think, therefore I am” named the study “Videor ergo sum!” that is translated in English as “I am seen, therefore I am” in order to display the existence practice and forms of the subject on Facebook and the resource of desire of this web 2.0 subject. Image is not only dominant on Facebook which is one of the most important communication media in the 21st century but also also in other SNSs. The web 2.0 subject desires to see and to be seen in SNSs. Instead of written texts, visual materials are loaded and circulated in such sites. As a result of the dominance of visual texts, “being seen” was emphasized in the subtitle of the study and the position of the individual heading towards showing up and even espionage was examined. The study is composed of four sections. In the First Section, emergence of social networking sites, their features, usage practices of SNSs in the world and in Turkey, application types special to Facebook users from Turkey were all analyzed and the readers were informed of the current literature. The first section describes the research universe of the study, introduces current SNSs in virtual space and explaines the differences and similarities between SNSs with examples. In addition to this, various Facebook usage types are exemplified. The data collected on different Facebook practices developed for the Facebook users in Turkey showed how the local culture became a part of global market and global consumption culture. Within the scope of literature review, main researches carried out in the near past both in the world and in Turkey were focused on and the samples, methods and the findings of these researches were summarized. For this part, Collective Production tried to access to studies related to the usage practices of SNSs which were carried out in Turkey. Via Thesis Database service of Higher Education Board (YÖK), Collective Production accessed the limited number of the papers most of which were either published in academic journals in the field of communication studies or presented in conferences to a large extend. The Second Section of this study named “Immersion into Facebook” is composed of two different but complementary discussions: self-presentation on Facebook:profiles and performances and from public privacy to voyeurism, surveillance and showing up. Following the first chapter discussing how the profiles are created on Facebook and how the self is presented, there comes the second chapter discussing the transformation of privacy in virtual space. Self is created in a concealed way in virtual spaces and presented as a hoped and/or intended self on the screen. Facebook profile photo lets the existence of a person on Facebook be checked and confirmed and lets the Facebook users connect to this person and take a communicative action. The symbols, groups, photo-sharing and video-sharing are the other applications Facebook provides to its users to let them present themselves as they want. These applications give the Facebook users an opportunity to create the person they want to be rather than the one they are in their real lives. Most of those having an account on Facebook maintain their new or old daily social relations in SNSs. This issue is discussed in the chapter analyzing the profiles and performances. In parallel to the change in the perception of privacy issue in virtual space, electronic surveillance has also deepened and become widespread. This issue is analyzed in details in the Second Section. Collective Production examined how the nonymous identities on FB locate their identity positions and act in virtual space. What does Facebook mean for the survey respondents? Facebook means a communicative tool for 15% of the respondents, fun for 14% of the respondetns, surveillance tool for 14% of the respondents and a sharing environment for 13% of the respondents. Who do you choose as your friends on Facebook? It is clear that most of the Facebook users meet their Facebook friends whom they already know from their real lives. What kind of a relation do the respondents look for on Facebook? Most of the respondents look for “friendship” on Facebook. As seen on the chart, there are not big differences based on gender, but it should be mentioned that the majority of those giving the answer “any kind of relation and playing the field” are men. For the Facebook users, they prefer to be seen happy (40%) and mysterious (30 %) on their profile photos. In the chapter of the study callled “direct, intetional surveillance or surveillance in any way in SNSs”, how both the nation-state and capitalist companies watch the Facebook users via their existence coded in their images are explained with examples. Although the existence of Big Brother is obvious, the users consider this issue either normal or they are not aware. In the last instance, the desire to see and to be seen demotes the existence of the individual in the virtual space to images and defines this with images. By this way, the individual reaches the object of the desire as a part of the image/eye and surveillance/being seen. The nation-state takes its part in this surveillance practice, thereby watching/controlling its citizens. For example, Turkish Armed Forces has declared that they catched approxiametly a thousand fugitive solders via the surveillance practices on Facebook. The effort of the nation-state to register, control and dominate has gained a new digital dimension with the emergence of SNSs and Facebook mainly. The pleasure gained from the display of the self on the FB and espionage promoted by the nation-state are discussed at the end of this chapter. Nation-state puts an eye on the virtual space that it can not reach via such systems as “enunciationweb” (in Turkish “ihbarweb”) and makes this eye its own eye: the eye of its citizens. At this point, it is important to emphasize that every Facebook user has the power to see in a micropolitical area. They keep an eye on their old and/or new friends by closely following what their friends are doing, by viewing their profile photos, photo albums and by watching the videos they share on their walls. It is important to note that what is ironic here is that the Facebook user knows he/she is being seen and wacthed. What emerges here is showing up: a new pleasure of the Internet. This chapter of the study is based on the findings of the survey administered offline via the account we opened on Facebook. For the majority of the respondents (40%), there is not a private space on Facebook. The Third Section of the study is called as “social organizations on Facebook: the possibilities and dynamics of collective action from online to offline space”. In this section, different types of social, political, cultural organizations are analyzed by regarding Facebook as a text. Collective Production took a quick look at all the groups created related to current issues/events but could not reach the speed of the organizational practice on virtual space. We have observed that there are a lot of pro and con groups created almost in the afternoon about the issues discussed by the mainstream media and political actors in the morning and that petition campaigns are launched. Collctive Production opened the success of virtual campaings in the real life to the discussion based on two case studies: “The Murder of Münevver Karabulut” and the above stated campaing of “Open shelter for women in each district of Ankara” which was carried out by the group themselves. The group discussed whether these two collective actions would be successful or unsuccessful in the offline space; determined the possibilities and dynamics of collective action from online to offline space and made some suggestions. In the Third Section, the group also focused on the organizations spreading and naturalizing racist speeches and hate speeches and pointed out the threat of using the new media for these purposes. It is highly important to focus on the fact that the new media is gradually being more used for circulating and spreading hate speech which consists of the sexist, homophobic, racist, xenophobic contents, instead of being used for democratizing the social structure, enriching and developing the communicative action practice in the public space. In this section, Collective Production not only explained the possibilities of the new media for democratic social movements but also revealed the current contradictory situation. Another issue that needs to be dealt in relation to the previous sections emerges within the scope of denounciation/espionage/complaint. What is observed on Facebook is that the groups making racist, homophobic speeches or hate speeches are generally not closed or closed very late even when the authorities receive complaints against these groups. On the other hand, what should not be ignored is that although racist speeches and hate speeches are among the compaint subjects (despite not being functional), there is not such a choice on enunciationweb (ihbarweb) which is the extra eye of the nation-state. In other words, racist speechs and/or hate speechs are not the denunciation the nation-state is expecting; nation-state does not attach importance to this issue. Why do the respondents join the campaigns? In the Fourth Section of the study, Collective Production discussed the presentation of the Facebook in mainstream, traditional media and how the Faceook users view this presentation. To this end, online puplications of four ideologically different newspapers were analyzed based on themas in approximately four months. The group found out that mainstream, traditional media ignores/underestimates and disintegrates Facebook via mispresentation, underpresentation and overpresentation. Facebook increases its commercial value by its presentation on Facebook. However, as the thematic content analysis has revealed, this presentation has only one dimension: Facebook is either valuable or the users are counterfeiting; either the users are isolated from their social environment and looking for temporary satisfactions or Facebook becomes addictive. All these popular culture-related narrations do not explain the relation of Facebook with historical, cultural, political, economic and social circumstances and patterns. Facebook is neither white nor black. Not only mainstream traditional media but also public actors and authorities discuss the Facebook unidimensionally by labelling new media spaces and new media usage practices. For the usage practices of these new media spaces, protective, traditional, neo-liberal ethical codes are promoted and shown as “formal and popular”. The followings could be given as examples: enunciationweb (ihbarweb), Telecommunication Authority’s filters, prohibition of access to some sites enforced “by” Information and Communication Technologies Authority. These prohibitions put barriers to the development of the responsibility of the individual on new media spaces and hinder him/her from behaving as participant citizens. Unidimensional presentation of new media spaces (especially digital plays) and tools (Internet) and of mainly Facebook, which means ignoring or reducing different dimensions of events-facts on mainstream traditional media, hinders readers and followers from seeing/understanding the opportunities and risks related to new media usage practices. This is why Collective Production analyzed the presentation of Facebook on mainstream traditional media in the Fourth Section which is the last section of this study. SNS users shift from one social networking site to another just like keeping pace with the fashion. For example, while MySpace was once the most popular social networking site in U.S.A, Facebook is now in the first rank. When we look at Turkey, once Yonja, Mynet and Siberalem were highly popular, Facebook has now become more and more popular especially among the youngs. The age range of Facebook users has increased to above 30 years old and today SNSs attract a big percentage of the population having access to media and being media literate. At this point, it is possible to state that SNS usage has immediately become widespread and the SNS users jump from one SNS to another. Number of the registered Facebook users from Turkey is approximately 13 million and 500 thousand. More than 11 million of these users is above 18 years old. In our study called “Facebook: As a Social Networking Site: ‘Videor ergo sum’”, we drawed two different frameworks for Facebook use and Facebook space: the alteration in the Facebook users’ understanding of the privacy issue and two new concepts occured during the uses of Facebook and other social networking sites: showing up and espionage. These two new concepts can be said to be the reflections of the important role of the new media in the daily life routine. In the popular culture-related narration circulated in the new media, the dominance of image gives pleasure to the individual. The dominance of visual thing makes the action of “seeing and being seen” natural and legitimate. As a result, the individuals become inured to the actions of “seeing and being seen”. While the individual who wants to see wacthes his/her old and/or new friends in social networking sites at micro level, at macro level the capitalist organizations including the security forces of the nation-state follow the electronic footstep left on virtual spaces. The advertisements and the friends’ accounts visited on SNSs are continually and regularly registered in details by the advertising and marketing companies. These databases are used for personalized advertisement campaings or product promotions. The action of stalking is not a mysterous and mystical travel enabling the individual to know himself/herself and to become free which is implied in the Andrei Tarkovski’s metaphore of Stalker. In contrast, here, it presents all the electronic registrations of the activities carried out by the individual for the aims of self-improvement to the control/surveillance of nation-state or transfers these registrations (user accounts, profiles, interests, relations) into commercial value and puts into circulation in the market. As the Facebook and Twitter are becoming the baseline for developing and maintaining our social relations, arrangement and management of these areas by micro and macro power structures are getting more attention. The surveillance taking place at micro and macro levels invites the individuals to “denounce” those displaying illegal behaviour. What needs to be emphasized here is that the individuals accept that different opinions and contents are not legitimate in every field of the social life including virtual space at any time. So participating in the mechanism of denunciation is not by force but by the invitations made via social networking sites which are one of the ideological tools of the state. The individuals accept these invitations in order to live in safe without taking any risks in terms of the social ethical codes and patterns defined by the capitalist market economy and the nation-state as “beneficial” and “acceptable” for the social order. In return for their help, these two institutions inspire the individuals with confidence. The fact that the Internet and new media practices are becoming common neccessitates to make the individuals confident in virtual spaces. It becomes neccessary to protect the individual from fake and false identity presentations, hackers, virus softwares and his/her personal information being stolen. This means to call the legal regulations and security forces to work just like in the real world. How the framework of this call is drawn in Turkey was explained in this study with various examples. The Turkish Law No. 5651 categorizes Internet usage practices as space provider, content provider, collective access provider and regards actions considered illegal on virtual spaces as “crime” within the scope of the Article 8 of the Law No 5651. Telecommunication Board, the execution body in accordance with this Law, wants the citizens to denounce these kinds of actions carried out on virtual space to the executive “hand” of the Law via www.ihbarweb.org.tr. Collective Production tried to explain what an “ordinary” person does on Facebook and its features. What Collective Production found interesting in terms of SNS use is that the individual transfers the habitus he/she creates in daily life to the virtual space and continues and strengthens his/her real life offline relations in online space. In contrary to the beliefs, the individuals maintain their social capital in virtual spaces. The “risk” of meeting new people is only taken if it is in line with the aim of the communicative act. Social networking sites are spaces are composed of the acquiantances and even those who are the same: everybody continues to exist in his/her own “circle”. As Collective Production, we say that we should shape our SNS usage practices without ignoring the online risks and opportunities of the new media. Our study has revealed that the mainstream traditional media mispresents, overpresents and underpresents the new media spaces which causes the readers and media followers to have an unidimensional idea about the subject. Such unitypical questions can be given as examples: “How much is the commercial value of the Facebook?” “How does Facebook increase its commercial value?” “Does Facebook use prevent your feeling of loneliness?” “Can you live without Facebook?”. Finally, we suggest that the discussions on the relation between the new media and the usage practices of the individuals should not be limited to the existence of the individual in virtual spaces but should include how the individual creates himself/herself in offline real life. For example, the everyday mentality of the users about racist, xenophobic, homophobic speeches and hate speeches circulated on Facebook should also be analyzed. Do they fight against such speeches in their daily lives? If they do, in what ways? If not, why are they indifferent to this issue? These questions and usage practices should be analyzed alltogether. Indifference and unawareness of the individuals about the hate speeches on new media spaces continue in the real life patterns. Therefore, other SNS users should be intervied via in-depth interviews or focus group methods and the experiences and opinions of SNS users should be analyzed. Definitions and discourses about dominant situations recreated by being re-circulated in traditional media contexts, brain pattern of the individual, new media usage practices are the milestones that should be analyzed all together. This book is an attempt to link media literacy with critical pedagogy. It focuses on the historical development of critical media literacy by reviewing the applications from Turkey and other countries in the world. The authors argue for the necessity of going beyond the mainstream perspective, and explain the constitutive dimensions of critical media literacy. The last chapter of the book is specifically on gender and critical media literacy. In the concluding chapters, the authors consider critical media literacy as one of the tools of social transformation by relating it with critical citizenship. 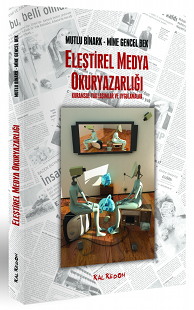 The book which analyses media literacy in Turkey critically and develop suggestions is a pioneering study in Turkey. game world the player has to invest in online economy by spending his/her real money. In this context, in the first part of the paper, a brief history of the widespread of the Internet cafés in Turkey will be summarized, and then, the findings of the ethnographic field study, conducted in Ankara at micro scale will be discussed. At the end of the paper, the development of new media literacy approach stemming from both critical pedagogy and critical media literacy theory, which gives responsibility to the user and the education process itself, will be suggested against the conservative technopolitics that recently aims to protect children and young people through controlling the content of the Internet and Internet cafés in Turkey.